This article is about the reasons why entry of women to Sabarimala is a victory for human progress and gender equality. To read the flip-side, click here. The SC allowed women entry to Sabarimala in September 2018. Picture courtsey Newslaundry. It is illogical and baseless to keep women of the age group 10-50 from going to Sabarimala. Though Kerala has the highest literacy rate in India, the fact that there still exist such discriminatory practices in the name of tradition and religion, is unfortunate.The state has had a history of a number of discriminatory traditions, many of which have been done away with,owing to protests from the affected sections. Ridiculous traditions wherein people from ‘lower castes’ were not permitted to enter temples or appear in front of people from the ‘higher castes’, paths trodden on by a person from a ‘lower caste’ were considered to have been defiled,and hence- avoided by the ‘upper castes’, have existed in the state. However, with time, society has evolved and became more progressive- thanks to efforts by social reformers such as Chattambi Swamikal, Ayyankali, Sri Narayana Guru and Chempakaraman Pillai to name very few. It can be noted that at no time in history was change easily accepted by all factions of the society alike. It can not be brought forth with the mere snap of a finger but instead has always been a result and product of some form of long protest, agitation or struggle by affected sections. In a similar manner, the verdict of the Honourable Supreme Court is a welcome spark of change in an ancient discriminatory tradition which has continued for way too long. Now that there is legal backing for women between 10 and 50 years of age, devotees can visit Sabarimala and offer prayers. The most cited base for the discrimination meted out against women in this age group is the grounds that Lord Ayyappa is a Perpetual Celibate and that it needs to be respected. According to the Temple Board, the deity in Sabarimala temple is in the form of a yogi or a Brahmachari. The god in Sabarimala is in the form of a Naisthik Brahmachari. This is the reason why young women are not permitted to offer prayers in the temple. Since, the deity is in the form of a Naisthik Brahmachari, it is therefore believed that young women should not offer worship in the temple so that even the slightest deviation from celibacy and austerity observed by the deity is not caused by the presence of such women. A question which can be raised at this point is - Which sacred text mentions that a Naishtika Brahmachari can not be in the physical presence of a woman?Consider Lord Hanuman who was also a Naishtika Brahmachari- commited to the principle of celibacy from birth,for instance. Did searching for Sita in Ravan’s inner palace among other beautiful women make him any less celibate?There was not even the slightest modification in his steadfastness to the commitment to asceticism, nor did he experience any desire in his mind. Even today, women visit temples of Lord Hanuman and are allowed to visit him and worship him. Another reason put forth in justification to Sabarimala’s age old custom is the inability of women in the menstruating age to complete the 41 day vratha which needs to be undertaken to go to Sabarimala. As opposed to olden days wherein there weren’t ways to manage menstrual hygiene, the scenario in today’s world is different. With the advancements in modern science, there are several products to contain the effects of this entirely natural process and even to delay or advance it. Protectors of ‘tradition’ may oppose this stating that such methods are unnatural and should not be used owing to health side effects. A woman who is prepared to use these products to be able to complete the 41 day long vratha will most surely be aware of this. Despite the possible side-effects, if she is still willing to take the vratha, it can only be a measure of her devotion. Mass protests have rocked the state of Kerala in wake of the SC verdict and subsequent State government actions. Moreover, the question arises whether all traditions of Sabarimala have been maintained till date? Traditionally, it was the tribal community of Mala Arayans - historically said to be close aids of Lord Ayyappa - who used to light the sacred lamp ‘Makara Vilakku’ each year. However, after the Travancore Devaswom Board took over the administration from the royal family, the tribal community was displaced and subsequently the Kerala State Electricity Board (KSEB) has been lighting the Makara Vilakku for over half a century. Similarly, an Ezhava family by the name of Chilrappan Chira used to enjoy exclusive rights to a prominent custom called “vedipazhipadu” (lighting ceremonial fireworks) in Sabarimala. But this too has been discontinued. Are these not traditions which have been broken? And hence aren’t protestors being selective in their fight for the upholding of traditions? According to the Temple Board, only the Brahmanical Thanthris (priests) have the right to decide the laws related to the usage of the temple and are the final authorities to take a decision in any controversial issues with regard to the religious practices and custom, as well as the rituals and poojas in Sabarimala temple. The vestment of such a power solely with a group of Brahmin individuals cause the interests of non-Brahmins such as the Mala Arayans and the Ezhava family to be neglected. Even then, there have been instances of women in the 10-50 age group entering the temple as part of the choroonu rituals of their children as well as for film shoots. It was only in 1991 that the Kerala High Court came out with the judgement prohibiting women aged between 10 and 50 years from entering the temple. The current agitation in Sabarimala also arises from the reluctance of an inherently patriarchal society to change its ways. 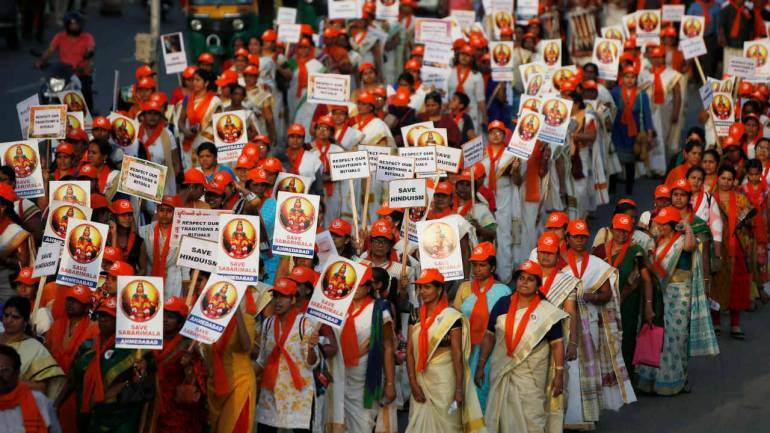 It is ironic to note that it is women who are at the forefront of the ‘Save’ Sabarimala movement - a clear instance of patriarchy being deeply etched into their rationale and beings. It has become part and parcel of the social indoctrination and discrimination feels perfectly normal. Those who go against mainstream ideology are ostracised and branded as “enemies of society” and -more dangerously- their voices, stifled. Let those who truly believe in it heart and soul be allowed to visit Sabarimala. It is only when non-believers argue for their newly-won right to enter this holy shrine and try to visit Sabarimala only to prove a point, that matters get worse. There should be no obstacle in the way of true devotees to worship the God of his/her choice. After all,a world wherein everyone is equal, without any biases, would be resplendent with harmony and without doubt, a better place to live in. If you donot believe in the princple of brahmacharya/ ayyapa as a god . Why do you even bother about the temple. If you are not a true devotee and do not believe in Ayyappa Swamy then why you want to visit? It’s not a resort and not a public place for anyone and everyone to enter. Hindus respect every religion but it doesn’t mean that everyone are welcome to enter into our traditions and rituals. If you think that it is equality, then why you are trying and arguing only for Hindu ladies? Why don’t you try for Christians and for Muslims? Muslim ladies are the real victims of inequality due to triple talaq. At least their life will be in trouble. Age restriction in Sabarimala is not harming anyone. So first show courage to bring equality in other religion.